Older students in the Lower School begin by looking at their neighborhood today, and gradually expand outward across time and space to embark on historical studies for the first time. Children come to appreciate the dynamism and diversity of New York City, including the role they play as engaged citizens in its evolving story. Expanding on the idea of citizenship, our older students learn about the roots of our government and culture, what makes our city and country distinct in the world, as well as what links us to other countries and cultures. These historical studies pave the way for explorations of American history and government, and provide context for later studies of ancient civilizations. Explorations of families, jobs, and life cycles are typical themes the 4s pursue as they begin thinking about their place in school and their neighborhood, and paying attention to the natural world. Children in the 4s have many opportunities to play. 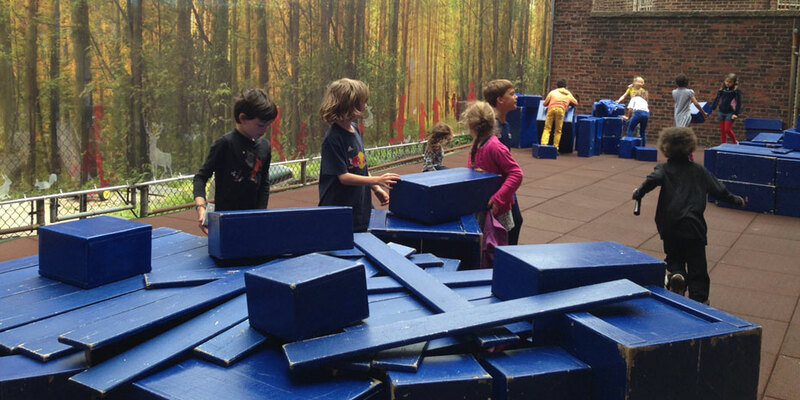 Through open-ended materials such as blocks, sand, paint, and water they explore and practice concepts of literacy, mathematics, science, social studies, and the arts. As children grow, first-hand experience continues to be integral to learning. 5s begin to explore familiar institutions and places — the school, the grocery store, the park — with a more finely tuned eye. Children may learn about the people and processes involved in food production, delivery, and preparation. They take trips to community gardens, rooftop farms, farmers markets, the food co-op, supermarkets, and restaurants. Studies of local trees, and the creatures that live in them, provide meaningful opportunities for children to explore the intricacies and diversity of natural life. 6s often study neighborhood businesses, exploring the ways in which people work together in various roles to accomplish complicated tasks. Children may research the workings of restaurants through visits, interviews, and a variety of media, culminating in the creation of their own restaurant. A study of the East River provides the chance to explore a local ecosystem, leading to a greater appreciation for how people and animals make use of their environment. Develop conflict resolution skills and a sense of responsibility toward self and others. Communicate needs and feelings clearly and respectfully. Acquire interviewing and note-taking skills. Notice similarities and differences in people and places. Recognize interdependence in a variety of contexts. Use observation skills to generate questions. Identify the needs of living things. Explore physical properties of matter, and changes in plants and animals through the seasons. Understand how particular physical traits of animals affect their survival. Compare and contrast animal species. Begin to make logical inferences based on real-world experience. The 7s investigate familiar and tangible elements of their urban environment in new and more complex ways. By observing aspects of their immediate surroundings and visiting other parts of the city, students make comparisons among neighborhoods. An in-depth study of the transportation system gives 7s a stronger geographic understanding of the five boroughs, as well as a chance to look at how this complex system evolved over time as the city expanded. A study of local bridges is often a highlight, allowing students to explore engineering principles and historical developments. In the 8s, students study the history of New York City through the lens of immigration, identifying common themes across time. Students become immersed in studies of daily life during distinct historical periods, learning research skills through studying maps, photos, documents, and data. Because it is their first historical study they start closest to home, examining family stories of immigration. Students then work back- wards through time across different periods — for example, the turn of the 20th century, and the Dutch Colonial Era. They become adept at using evidence to support their growing ideas about the past, linking their own families’ experiences to the experiences of others throughout history. Students in the 9s consider questions of governance in the Americas. They look to current-day local politics as a precursor for studying life in the colonies before the American Revolution, and learn about the factors that led to the formation a new nation. They extend this arc to look at the government of a people indigenous to the Western Hemisphere such as the Maya or Lenape. Over the course of the year students gain a critical lens for looking at history and consider issues of power and justice, the individual and society. 10s broaden their understanding of the distant past through in-depth studies of ancient civilizations such as Greece and China. By examining the cultural, governmental, and philosophical aspects of Greek society, students continue to foster an understanding of the foundations on which our own society was built. The study of ancient China provides an important contrast, especially in terms of government and culture. 10s students sharpen their critical thinking skills and further hone abilities in developing and expressing strong arguments through writing and oral debate. Understand concepts of chronology and historical events. Appreciate similarities and differences among cultures. Raise questions and seek answers from historical stories and records from the past. Understand the interdependency of living things and physical environments. Learn about government structures and the need for rules for resolving conflicts and disagreements. Read and interpret different types of maps. Apply information from field trips to classroom work. What do neighborhoods have in common and how do they differ? How can citizens make important changes in local community? What does it mean to live in a community consisting of people from all over the world? What are the factors that influence people’s moves across continents and cultures? Who has access to power in society? What do the artistic and scientific achievements of past cultures tell us about those societies, and how have they influenced our own? How have different civilizations used their natural resources effectively? What factors contribute to the success and demise of an empire?